Every Sunday evening where I live here in New Jersey right near the coast, I put out my trash of the week. One container is designated for “real” trash; the other is designated for recycling. There is so much out there about recycling, there are those for, and those against. Everyone has data and everyone has an opinion. So what is recycling? What are my plastic milk containers, soda cans, cardboard boxes & more really accomplishing? What’s also interesting is that in some communities, if you include recyclables in the regular trash, you will be issued a warning that if done again, the perpetrator will receive a fine from the city. Back in the day when resources were scarcer, people used to take the old fabric from a piece of clothing and re-design it to serve a new purpose. We still do that sometimes by taking an old undershirt or towel and using it as a rag. Recycling was essentially part & parcel of the average household who could not afford to buy new items. Businesses and factories did not always have access to new raw products & therefore creating a brand new product directly became expensive. I still remember when my mother patched my pants up. My grandparents used to even wash plastic plates. The whole idea of disposable was foreign to them! Following the war, there was more prosperity and reusing & recycling became a thing of the past. That was until a new movement began in the 1970s by U.S. Senator Gaylord Nelson from Wisconsin when activists reacted to the oil spill near the city of Santa Barbara, CA. There was extensive damage to sea life & the environment. This awakened an urgency to examine the environment, our use of resources and how to protect it from an environmental perspective, financial & practical standpoint. Click here for more information. Why use space for landfills when things can be recycled. Space can be scarce & expensive or plentiful & can be used for businesses or homes. Landfills can also create pollution. So why not minimize that. Plastic recycling can be not so efficient according to some. However, recycling steel can reduce a lot of energy (up to 74%) that it takes to mine iron ore,the refining process & forging new steel from scratch. Recycling can give people new opportunities for employment. It can shave off expenses of the city that would be used to pay for space in landfills by the ton. Each year, approximately 10 million vehicles are recycled. You can recycle up to 75% of each car. Recycling cans can save 95% of the energy to make new cans. Aside from all of this information on recycling, there are some more interesting, fun, & creative ways to practice this in your own confines. Many of these ideas can actually be an activity that will add cheer & excitement to your home and can be done together with your children & family. 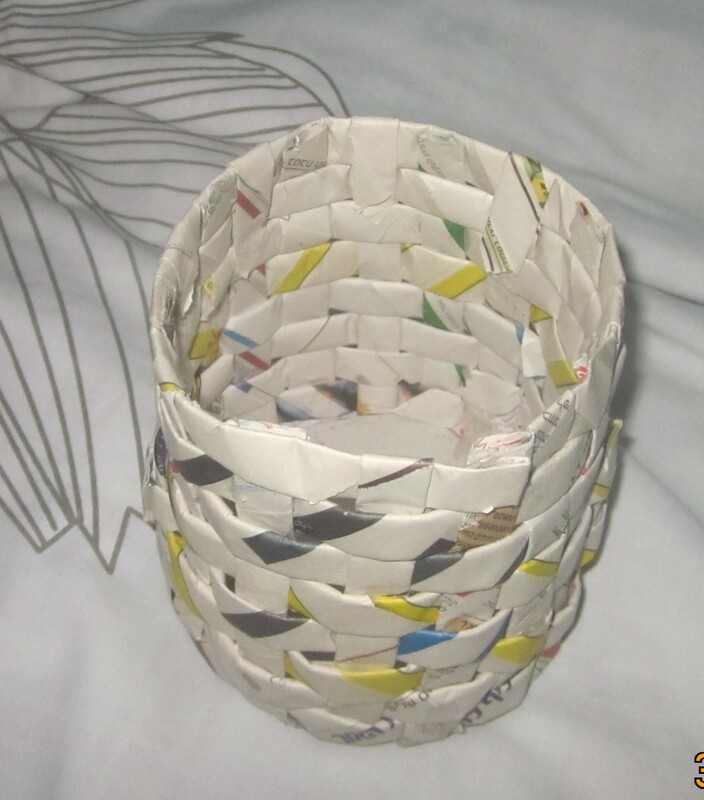 Here are some creative DIY recycling ideas! Ten Creatively Repurposed Licensed Plates – What creative things can you do with your old license plates. Share with us what you did! Eleven Creatively Crafted Lamps – Are you going to go to Home Depot or doing something cute, creative & unique? We’d love to hear! Recycle crayons into art – You know those old crayons that are just laying around that you want to throw out. Here is a different set of ideas. 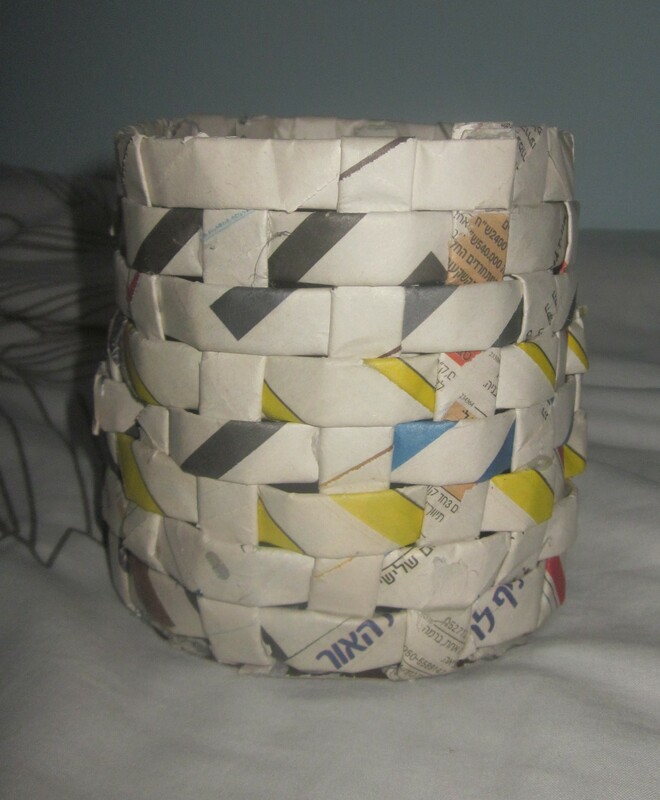 Here are two images of a wastebasket made out of newspapers by my own sister, Batya Geberer. Pretty Cool! Unfortunately she didn’t provide me with the “how to” instructions. Here are two nice videos that are geared for just these ideas. Have fun! So go on, have some fun with repurposing your old faucet (I’m sure you can find something creative to do with that), and happy recycling! Recycling industry consists of approximately 56k establishments that employ over 1.1 million people. Recycling can generate the federal, state, & local governments billions in revenue. I like this ideas, hope to see them in all the countries.